Thanks for stopping by on the Necropolis Enforcement Blog Tour of 2012! If you haven’t read the first chapter of The Night Beat, hit Deathless Prose over at my website and check it out. Then, hit each stop along the way to get more of the story. Missed a stop? 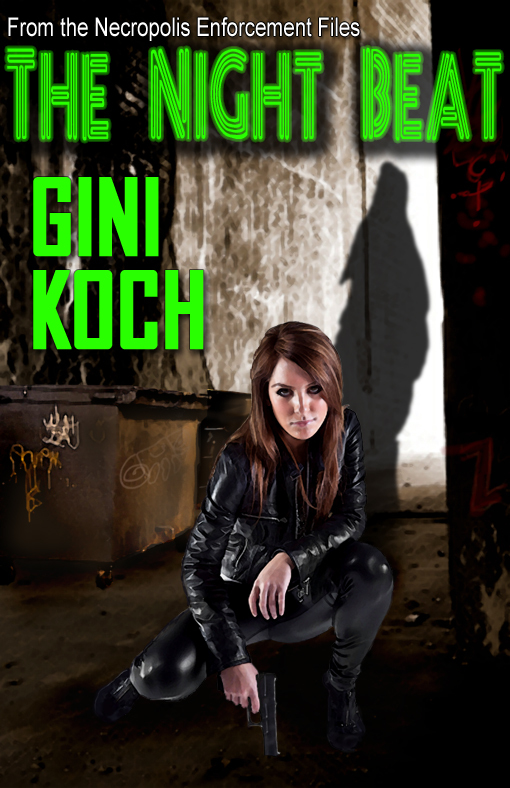 Check the website for the Tour Page http://www.ginikoch.com/blogtour.htm and get caught up. 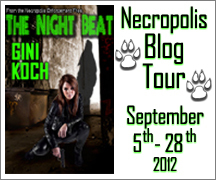 And don’t forget to get entered to win a copy of The Night Beat at EVERY blog tour stop along the way! Plus, follow the Tour ‘til the end and get entered for a mega-prize! So, grab your badge — it’s time to join Necropolis Enforcement! The majority of Prosaic City’s residents don’t know that their town exists on top of another place — Necropolis, City of the Undead. For the most part, the two planes of existence manage to remain separate. And when they don’t, Necropolis Enforcement has beings in place to ensure the general human population remains blithely clueless. Victoria Wolfe is more than just a policewoman. She’s an undercover werewolf assigned by Necropolis Enforcement to work Prosaic City Police’s Night Beat. Victoria’s comfortable working the shift where all the weird comes out to play, especially since her partner is also her perfect man. Or would be, if Victoria could ever work up the nerve to tell him she isn’t like other girls. It’s hard enough being a werewolf in disguise, but when a creature from the Depths of Hell shows up in an alley preferred by junkies, bums, and hookers, it’s going to take more than just Victoria’s special gun and werewolf skills to subdue the ancient Sumerian demon. Especially when the demon is merely the start of what appears to be a major takeover attempt by the Prince of Darkness. Soon all of Necropolis Enforcement’s Undead Brigade is involved in the fight to stop the Prince’s Major Minions from taking over Prosaic City and the rest of the human plane. But it’s Victoria who has to face the Adversary and figure out what intricate plan Lucifer has up his wings before everyone she cares about is destroyed. In other words, it’s just another day on the Night Beat. Amanda sighed. “No problem.” Vamps were strong and Amanda worked out. Not that she was the vampire equivalent of a body builder or something, but she was stronger than the average vamp. She was at least as strong as Monty. “I’d take one, but Vicki squirms,” Maurice said. Sadly, he was right. Werewolves don’t like to fly all that much. And Maurice loved to fly fast and wild. It was all I could do to not claw him and jump for the illusion of safety when I wasn’t hurt. When I was it took all my concentration and his to keep me from freaking out, even if he flew slowly. “You need to get moving,” Ken said. “I’ll see you later, partner,” Jack said as he handed me to Maurice. Maurice snorted, Amanda picked up H.P., our new zombie and our new succubus, and we all took off. Maurice had a point. I shut up, closed my eyes, and tried to relax. Didn’t help. I could feel the air moving past us, smell everything we whizzed by, hear the noises that showed me our speed. “What happened?” This question came from the succubus. “Well, an ancient Sumerian demon manifested and they always come out hungry,” H.P. began. I could recognize a lecture starting. I opened my eyes, did my best to drown out the lecture by humming “Werewolves of London”, and tried to enjoy the view. All things considered, Prosaic City looked pretty good from the air. Like all big American cities it had a variety of business and high-rise sections, older stately buildings surrounded by newer, sleeker ones, scattered suburban sections filled with every kind of tract home from simple to McMansion, a lot of streets and highways, an old downtown nice people didn’t want to be in after dark, a newer downtown where they did, and a variety of uptown and other higher class, hot spot, and trendy areas. Unlike many cities, it had a variety of rivers running through it and an impressive bridge system. And unlike every other city in this hemisphere, it had an underground like you wouldn’t believe. I love Gini’s books. Thank you for the tour. I have enjoyed reading The Alien series by Gini Koch and I am looking forward to reading this new one, I love cops, werewolves and the fun that I know Gini will add to the characters. Love your aliens and can’t wait to read this one too. 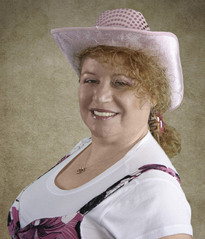 I have heard so many great things about Gina’s books! This one sound fabulous as well! Sounds like a great read!! Thanks for the chance to win! Thanks for hosting another excerpt – can’t wait to read it! Love Gini’s book. Just trying to catch up on the blog tour! Hey! Following through the tour, reading and meeting. 🙂 Thank you! (have a copy already) Thank you.